After a hugely successful weekend, we have many shining stars deserving of a mention. 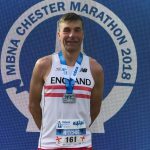 However, top of the list is Ritchie Gerry who put on his recently earned England vest, and teeny red shorts, to race Chester Marathon. Well done Ritchie, a richly deserved accolade; it’s brilliant to see yet another Stroller representing England. The XC guys and gals achieved well on Sunday up at Druridge Bay. The men were 5th, led home by SoTM, Jamie, followed by Andy Forbes, Mark Anderson, John Cook, Auld Ken and Ed Sweeney. Mark was the fastest Stroller in a time of 35:16. The ladies were 6th. Gilbo led the girls home and, along with Hasina (2nd Strollette) will be promoted to the medium pack next run out. Julie and Jo were our other counters for the girls. Well done to everyone who turned out, it’s a brilliant team event and it’s lovely to see numbers increasing from last season. And well done to Dan and Ken for promoting XC and helping lift participation. The events at Kielder had the usual high Stroller profile. This beautiful run saw not only quantity but quality from us. In fact, the girls had no less than three first places. Wendy Chapman had a magnificent run and was 1st lady home in the marathon; she works darn hard and this was a great reward. Dawn Elliott and Lyne Valentine bagged age category 1st places in their events showing us that good things come in threes. Well done to you all ladies, great running. Final mention to FGT and Malcolm. Both ran the Limestone Way Ultra, 43 miles. No mean feat from both, well done the oldies!